Wargod Captured! Can The United bend him to their will? Well, this is pretty darn late. To refresh your memory, last June I reviewed WARGOD #1 and then in September I reviewed WARGOD #2. Now I just finally ordered and received WARGOD #3. The same creative team is back, writers George T. Singley and Jim Mitchel, and artist Benjamin Morse. We pick up where the previous issue left off, Wargod has been captured by the superheroes of the group, HEROES UNITED, and is in the process of being possessed by whatever mysterious force that is controlling the other heroes. As Wargod succumbs, the presence reveals itself as Sutekh, which is another name for SET (I had to look that up), the evil Egyptian God whom, according to Egyptian mythology, killed Osiris (Wargod’s father). We learn that at some point in the past Wardog fought and defeated Sutekh, imprisoning him in some kind of magical prison. Sutekh reveals that the only way he could ever hope to escape was by gaining worshippers, because that’s how God’s maintain power. So he was able to devise a way to posses certain superheroes and get them to do his bidding. And with each new superhero that he possessed, and the more good deeds they performed as HEROES UNITED, the more fans and supporters they gained across the globe, all of whom were unknowingly celebrating Sutekh and thereby increasing his power. And now with Wargod under his spell, Sutekh finally has enough power to escape and become directly active in the world again. But the knowledge that his father’s murderer is behind all of this enrages Wargod so much that he has the strength to break free of the spell. And the majority of the rest of the comic is Wargod facing all the rest of the superheroes, who are still under Sutekh’s spell. The battle ends up taking them to the real of the Egyptian gods themselves, which Sutekh plans to conquer before moving on to taking over Earth. 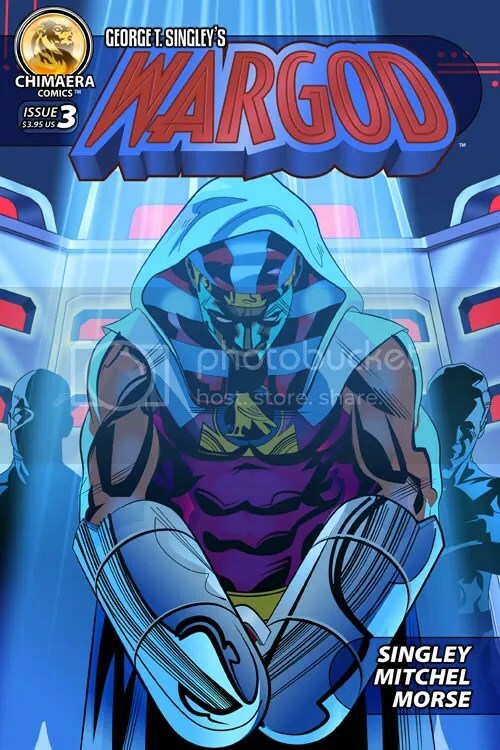 Can Wargod defeat the members of HEROES UNITED and convince them to join him in defeated their evil master? Well, that is left in a cliffhanger, which the end credits say will be concluded in “WARGOD: ABSOLUTION”. And considering that this issue was published in 2008 and it’s just turned 2014 with no sign of Wargod: Absolution being published, I think it’s safe to say it’s unlikely we will ever see it. So that definitely changes things. When I bought the first issue I knew that there were only 3 issues in total, but I assumed that these 3 issues were a complete story. Getting this issue only to find out that the story is incomplete was a huge letdown for me. I gave each of the previous issues 4 STARS and likely would have given this issue the same rating. But under the circumstances I don’t feel that I can honestly recommend it. The best case scenario is that you’ll buy all 3 issues and love the story, but then be forever denied a conclusion. So what’s the point? It’s a shame because I think the creators involved have obvious talent, and put together some good books while they could. And I know it’s not easy publishing indie books, so I can imagine that any number of things stopped them from finishing this series. It’s all the more reason why “we” need to support indie books when we can, to ensure that the creators have the means to continue.